An ominous threat spraypainted on the side of a car, two fatalities, and Rick's reunion with Morgan. 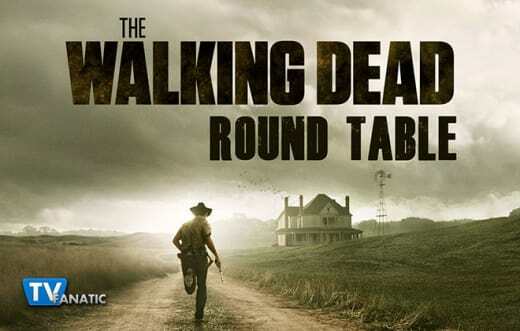 All that (and so much more) occurred on The Walking Dead Season 5 Episode 16. Now we'll have to wait until OCTOBER to find out what it will all mean. The Walking Dead Round Table is here to chat about the season finale, including how scared we all were for Glenn. Join Whitney Evans, Sean McKenna, Miranda Wicker, and Eric Nordhoff of The Walker Stalkers to find out what we thought about "Conquer." What was your favorite quote or scene from "Conquer?" Whitney: Rick and Michonne are my favorite twosome so I really enjoyed their chats. It's about time Rick let her in on what he's been up to and Michonne's "I'm still with you" was a powerful line. Eric: The scene where Rick basically pops a zombie’s head off to save himself. Epic zombie kill. Miranda: I loved the entire episode, start to finish, but there was something sort of amazing about Morgan's calm demeanor in the face of the Wolf who said "hey, we're going to kill you." Where did Morgan learn those sweet moves? Whitney: I have no idea, but how awesome was that whole opening scene? There was so much tension and I have to admit I was a little nervous for Morgan, but then he started swinging that walking stick around like a boss and it was great to watch. Eric: He spent time in a library reading and studying his Ninja moves. That’s what I picture at least. Miranda: Finally continuing Morgan's story is something I'm incredibly excited about. My guess is Morgan practiced his wicked stick skills on all those walkers he captured in his trap when he was crazy. Whitney: I'm still a little lost on what this group is. They're clearly scavengers who don't believe in washing their faces, but what is there actual deal? I know we have all next season to get to know them, but the finale left me with more questions than answers. 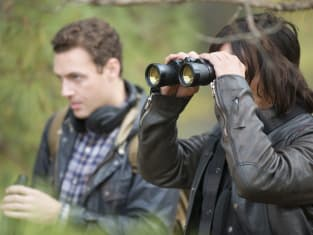 Sean: I think they are a creepy, scary and smart bunch, but I'm interested to see what makes them different from Terminus or any other group of bad guys. Eric: Did anyone else think it was funny that The Big Bad Wolves killed a guy in a Little Red Riding Hood!!?? So far, we only see two of them. Not too intimidating yet. They are pretty smart though - know how to manipulate zombies for their advantage. Miranda: Eric! That's amazing! I hadn't caught that yet, but I did catch that the guy in the hood had pictures of Rick and Carl which one of the wolves looked at toward the end of the episode. Wolves run in packs, so where are the rest of them? Do they want to kill people just for the sake of killing them? Be honest. Did you think Glenn was a goner? Whitney: I definitely thought I was going to be penning a eulogy for Glenn here! There were several times it looked like someone was going to bite the bullet, but none more so than Glenn. I would have liked to see how he got out of that. Sean: Yes. I really did. But then the longer the hour went on the more I thought maybe someone else would get killed! It was just tense for pretty much the fill episode. Eric: Yes, I did. I still think he might be bit. I don’t know. We’ll see. Miranda: I actually clenched up, gasped, and covered my mouth. Then I uncovered my mouth, cursed Nicholas, and covered it again. I thought Glenn was totally dead. His escape is way more believable than the time Tyreese killed a hoard of walkers with a hammer, though. 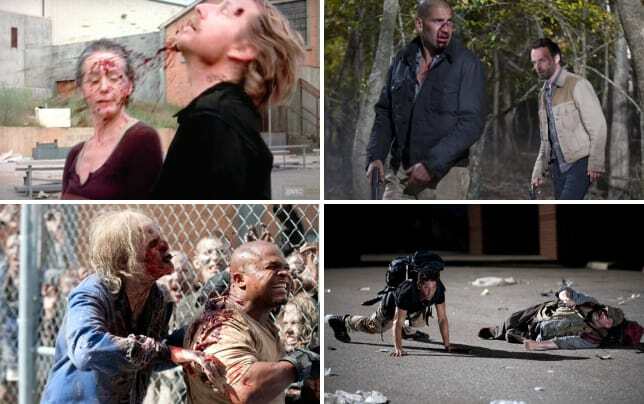 Was Rick's walker kill the most gruesome we've ever seen? Whitney: I'm going to go with yes, only because I can't remember another time when blood and guts got into someone's mouth. That was truly disgusting. Sean: It was gross, and the noise that went with it enhanced that. Right in the mouth. But he's Rick, so he needs to give speeches covered in blood. Eric: Yes, it absolutely was one of the Top 5 Zombie kills of all time. I wonder if that was Greg Nicotero’s idea! Miranda: GUTS IN THE MOUTH! VOMIT! That was the most disgusting thing we've ever seen. Is it necessary to teach the Alexandria-dwellers to fight back? Whitney: If they're all going to co-exist in Alexandria together, then yes the townsfolk are going to need to get in some training. They may never get to the skill level of a Michonne or Daryl, but they need to learn how to protect themselves and the town. Sean: Yes. Maybe not all of them will be trained fighters, but at least some general knowledge about how to fight, shoot a gun would be helpful. Eric: Absolutely. They have to learn how to be aggressive. The world isn’t a utopia and they are leaving themselves vulnerable in so many ways. Miranda: I think they need to learn vigilance and how to understand what's happening in the world outside Alexandria, but I also think there's something to be said for maintaining some of the innocence inside the compound. If they all get too hard, they run the risk of becoming like the Termites or the Wolves. Humanity is found in compassion and kindness and if that's going to survive, they have to find the right balance. Grade The Walking Dead Season 5 finale. Whitney: This probably won't be a popular answer, but I didn't love the finale as much as I thought I would. Was it the worst finale? Not at all, but I went in with really high expectations and I was very much underwhelmed. Season 2 was the best finale in my opinion, so if I'm giving that an A+, I'll have to downgrade this one to a B.
Sean: I'd give it an A. Looking back a lot of it set things up for Season 6, but I was invested and engaged the entire time. There was great pacing and thrilling moments (even though Father Gabriel drives me nuts). Alexandria was definitely a fresh switch for the show and I'm excited to see what's next. Eric: A+ in my book. The best finale of any of the 5. Multiple storylines, kept my attention the full 90 minutes, zombie kills were amazing, lots of action. Loved it. Miranda: I'm giving it an A+. It didn't leave us with any crazy cliffhangers, but it set up the next season perfectly. It was engaging throughout the entire 90 minute run. I feared for my favorites and found relief when I learned they were still alive. We didn't lose a main character for shock value. I loved it. What's next for Rick and Jessie after Rick shot Pete? Whitney: Even though Pete did kill Reg and he wasn't a good guy, he was still a husband and a father. And I can't imagine after watching Rick kill him without even a moment of hesitation, Jessie will just fall into Rick's arms. There is going to be a lot of awkwardness there and if things do turn romantic between them, I can't imagine it will happen right away. Sean: I've been hearing some theories that some people think Rick didn't kill Pete, and we didn't see him actually die. It's an interesting theory, but I think Rick killed Pete, and now, Rick and Jessie are going to make like The Brady Bunch. But will that really last? Eric: It will be good for Rick to finally find some romance. I like her character and I look forward to seeing how their relationship develops. Miranda: Did Pete intend to kill Reg? He showed up with that knife, but it almost looked like he killed Reg on accident. Regardless, he showed how reckless and dangerous he is and I daresay there wasn't a person among them who didn't think he needed to die. That Deanna told Rick to do it after saying that's not how they did things shows that she's paying attention more than we think. As for Rick and Jessie, why do I get the feeling that this won't be a big deal for her at all when she should probably be slightly terrified of Rick?